What to look for when choosing a Carrom Board? In Carrom the board, much like in chess or checkers, is the base where the game takes place. The standardized Carrom board needs to have a playing surface made of plywood or a similarly smooth and stable wood and cannot be less than 8mm thick. The official playing area needs to be a square measuring at 29" (74cm). The board itself will also be a square and its overall size will depend upon the dimensions of the frame which is made from different types of hardwood, such as rosewood. Depending on the thickness and the type of wood struts are sometimes added to the underside to provide extra stability and avoid warping. Harder more stable woods and thicker surfaces do not require struts to be added. The surface should also be completely smooth to ensure that when an average striker weighing 15gms is flicked with maximum strength from one of the ball lines onto the opposite frame it bounces back at least three and a half times. This should be made from a hard wood with a minimum height of 1.90cm and a maximum height of 2.54 from the playing surface. Its internal corners should be rounded and on the entry level boards these are usually reinforced with a more resistant wood such as rosewood. A higher specification board will use harder woods and have wider frames than an entry level or junior board. The four corner pockets should be 4.45cm in diameter - with 0.15cm tolerance at most either way - and should be rounded on the inside and not on the outside. The section of plywood that joins the corner of the frame should be cut off. The pockets should be fully lined with nets from the underside and need to be capable of carrying at least 10 coins. Our aim is to bring you the best quality Carrom boards available regardless of your age or level of experience. All of our boards are made in India by skilled craftsmen and come with 1 year warranty. Our compact Synco Mango66 Carrom Board is a fantastic option for introducing children to the game. 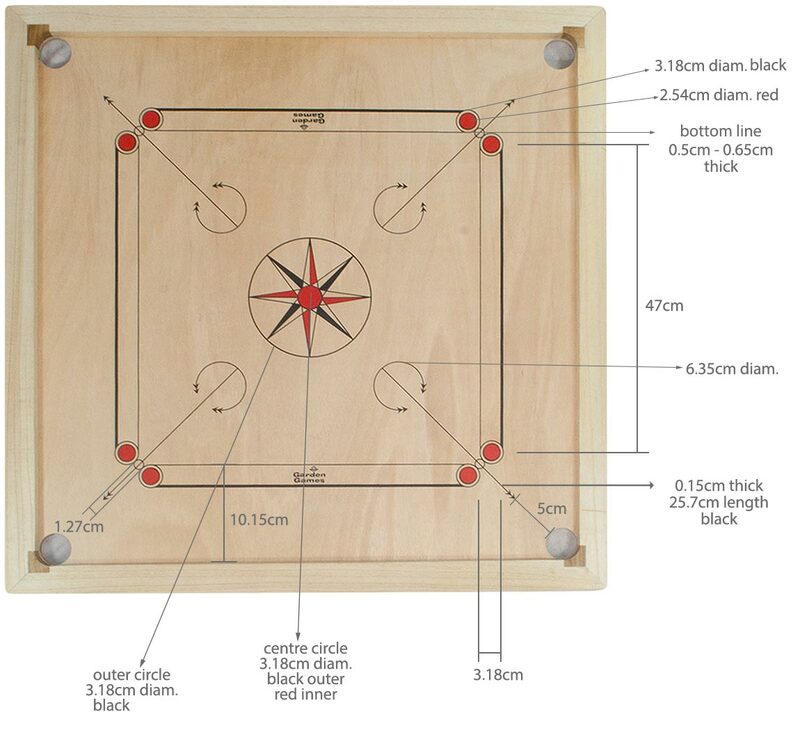 It has a slightly smaller playing surface of 61cm x 61cm which makes it easier to pocket the Carrom pieces. If you need a full size entry level board then our Wooden Set is a great option. It is great for everyday use and come with everything you need to play with the whole family. Moving up in size in the range we have the Synco Green Carrom board. This has a unique look and resembles a snooker table, so if you are a fan of or making the transition from snooker to Carrom this is the board for you. Moving to towards the top of the range is the Championship Carrom board. This is manufactured to competitive standards with a 16mm thick playing surface and Rosewood frame. Next, at the very top of the range we have the Synco Platinum Genius and Synco Signature Carrom Boards. The thick English Birch Plywood playing surface - 20mm and 24mm respectively - is hand polished to ensure a smooth and low friction play and the frame is made from strong Kikar wood. Used by professional Carrom players these boards are of the highest quality and were chosen as the official boards for the 2016 and 2015 Carrom World Championships.